This kent electric rice cooker comes with a one touch operation that helps you prepare your favourite dishes with ease. The innovative device not only makes cooking hassle-free but is also easy to clean and store making it the ultimate kitchen appliance. 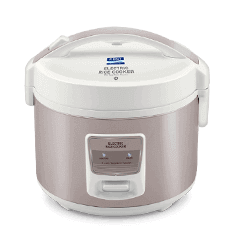 The electric rice cooker has an innovative cook and serve design. It comes with a high quality and non-stick aluminium inner pot the evenly distributes heat to cook tasty food every time. To Recieve updates and possible rewards for Kent 16014 please sign in. To Recieve updates and possible rewards for Electric Rice Cooker please sign in.